Almost everyone I know has been touched by cancer in some way. Whether it is a family member, a friend, a colleague or an acquaintance, I can think of almost a dozen off the top of my head - with several of them battling breast cancer in particular. As advancements are made in technology and more and more time is put into scientific research to understand the best possible treatment options, it seems that beating cancer can be within our reach. That is why it is so important to support funding the organizations that are leading the fight. For more than 75 years, Louisvillians have known that their local Dean’s Dairy products provide gallons of nutrition to their families. Now, Dean’s Dairy is also providing gallons of hope in the fight against breast cancer. Beginning September 26 and continuing throughout the month of October, Dean’s Dairy is inviting the community to buy a gallon, and make a difference. For each sale of specially-marked gallons of Dean’s DairyPure white milk sold in the Louisville area, Dean’s Dairy will donate five-cents to the American Cancer Society. I don't know about you, but with growing 4 kids at home, we go through 2-3 gallons of milk a week! 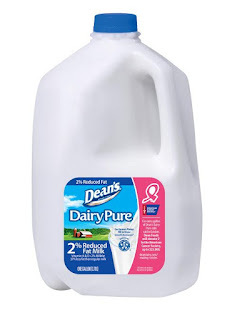 So while you are doing your grocery shopping, look for the Dean's DairyPure white milk gallons that feature the pink ribbon and the American Cancer Society logo, and know that with every gallon purchased, you are doing a small part to help the fight against breast cancer. Let me know where YOU find your specially marked milk in the comments below! Learn more about Dean's Dairy and their Five-Point Purity Promise to provide the best tasting, antibiotic and growth hormone free milk online at deandairy.com or visit Dean's Dairy on Facebook. *This is a sponsored post. As always, all opinions are my own.